Click Here to view session and rotation assignments. The Millennium Hotel is no longer being used for Nationals 2013. All previously booked rooms will automatically be transferred to one of the two new host hotels with no interruption or inconvenience. If you have already booked your rooms for Nationals, you DO NOT need to contact the Millennium. You will receive an email letting you know to which hotel your rooms were transferred and your new reservation information. Any hotel updates will be posted on the website and emailed to the NAIGC listserv. The room block at the Radisson is currently full. There are currently 20 rooms available at the Marriott at a rate of $115/night + tax for double/double rooms. To reserve rooms, call 1-888-236-2427 by March 20th. The room block at the Crowne Plaza is currently full. We will update this page with more information if rooms become available. There are currently 20 rooms available on Thursday, Friday and Saturday night at a rate of $119/night + tax. To book a room at the Hyatt please visit their website here. For those flying into Minneapolis, you can take the City Light Rail, which runs every 10-15 minutes, from the airport to the hotels. There is a rail stop 2 blocks away from the Radisson, the Marriott and the Crowne Plaza, and 9 blocks from the Hyatt Regency Hotel. There is bus service available to connect to the Hyatt. Travel time is approximately 40 minutes and costs $1.75. After 10:30 p.m., trains run every 30-60 minutes. The city buses that run down Nicolette Mall Road go to the Hyatt and the convention center and are either free or cost $0.50 per ride. Information about the light rail can be found here and a city travel planner can be found here. The NAIGC also has a discount with SuperShuttle for the event. The SuperShuttle picks up from Terminal 1 at the airport and will drop off at any of the 4 hotels. Rates are $15 per person plus $1 fuel surcharge one way, or $24 per person plus $2 fuel surcharge round trip. To make SuperShuttle reservation with the NAIGC discount click here. They can also accomodate walk-ups for the discounted price at their counter in Terminal 1 at the airport. There will be an NAIGC sign at the SuperShuttle counter. To get from the Marriott and Radisson Hotels to the convention center you can take the number 10 Bus. The bus stop is outside of Marshalls on the corner Nicolette and 7th. The Minneapolis Skyway System is an interlinked collection of enclosed pedestrian footbridges that connects various buildings in Downtown Minneapolis, and will enable members to walk in a climate-controlled environment from the Marriott and Radisson to the convention center. This route is approximately 0.8 miles and will take 10-15 minutes. Please note that based on these timings you may not be able to use the Skyway after late night sessions, to get to the annual meeting on Saturday morning, or after banquet on Saturday evening. We went straight to the source and asked the experts, the University of Minnesota Gymnastics Club, to share the best of their city. For more details on the attractions above click here. For a list of restaurants that are good for large groups click here. 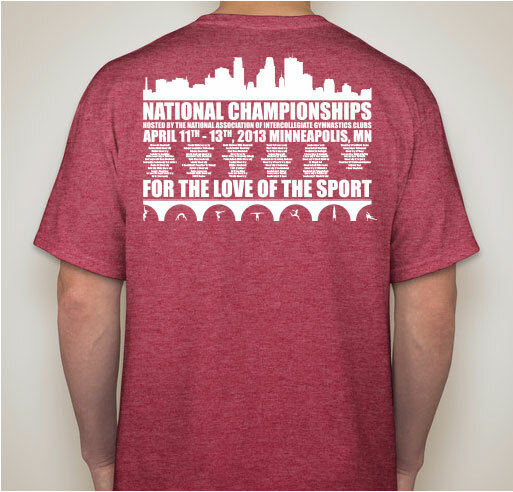 Every Nationals competitor will receive a Nationals 2013 event tshirt. Check out the designs below! 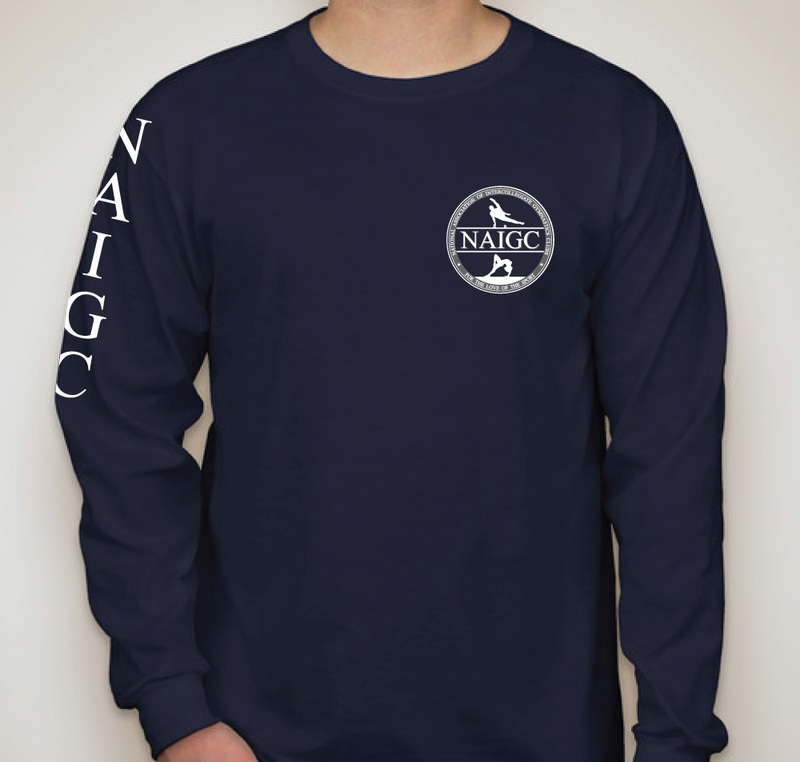 This year, every NAIGC paying member receives a long sleeve shirt as their membership gift. Check out the designs below! All payments can be made online. However, if you are paying by check, you must include this Check Submission Form with your payment. More information will be added to this site as it becomes available. In the meantime, please feel free to contact Kristy Fries with any questions. Thanks, and have a great season! More information coming soon!! Individual membership is required from each individual to compete in NAIGC sponsored meets (Nationals for this season) and to participate in other NAIGC activities (i.e., clinics/camps). Individual membership is open to athletes, coaches and anyone wishing to support the NAIGC organization. We also offer a coach membership for $15 per person that allows for more limited participation including floor access for coaches at NAIGC competitions. All of these proceeds go to help fund and support the organization. The membership fees are separate from Nationals meet fees. 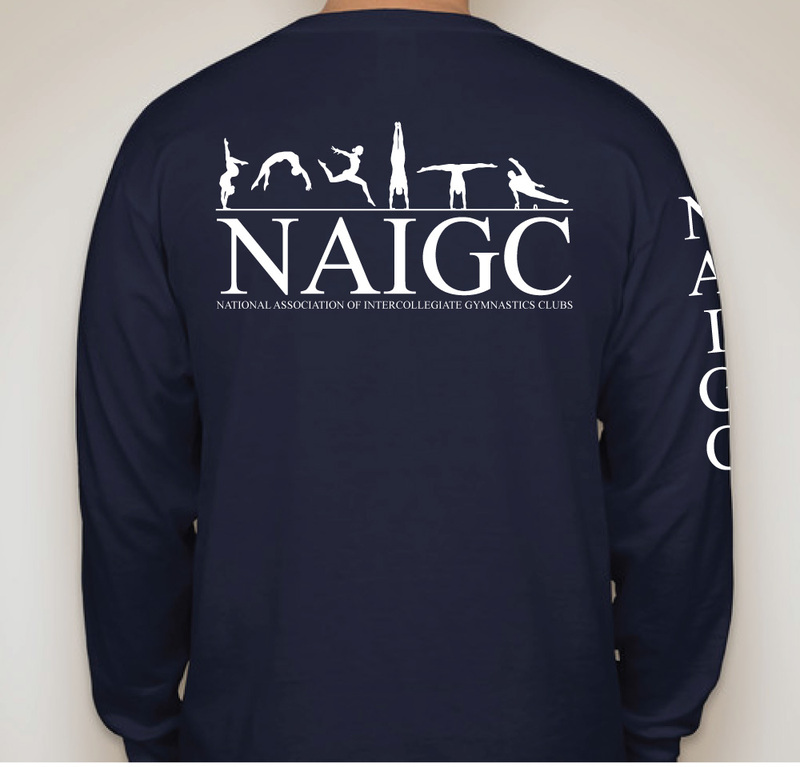 All individual members will receive a free NAIGC long sleeve t-shirt as part of their membership with the organization. 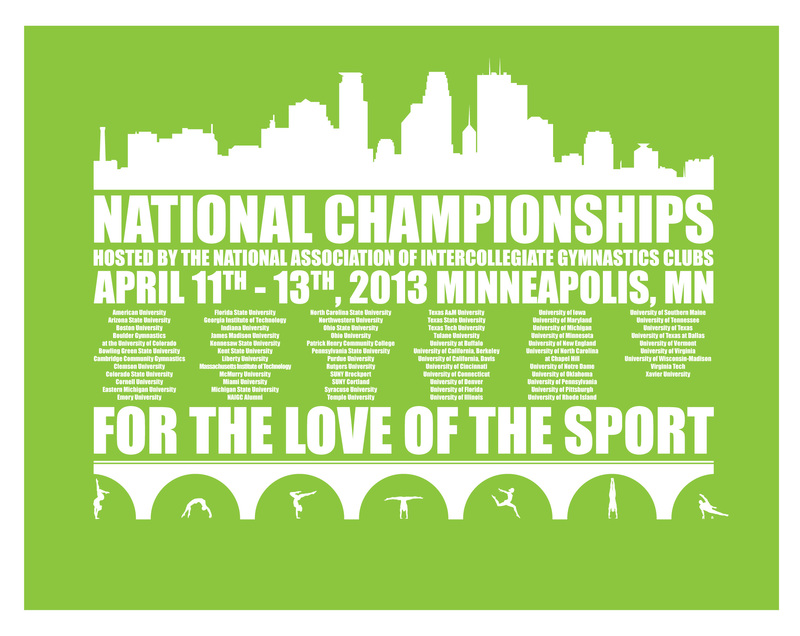 Nationals 2013 fees include individual registration fees, and team fees if competing as a team. These fees are in addition to the NAIGC membership fees (described above). Each club must pay an individual fee for each individual competitor, as well as a team fee for each team that is entered into the team competition. $70 for early bird registration paid / postmarked by February 1, 2013. $80 for regular registration paid / postmarked between February 1 and March 1, 2013. $105 for late registration paid / postmarked after March 1, 2013. $100 paid / postmarked by March 1, 2013. $125 paid / postmarked after March 1, 2013. 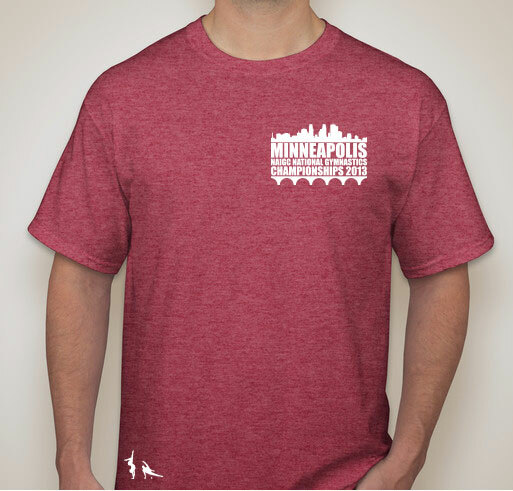 $25 per person paid / postmarked by April 1, 2013. $30 per person paid / postmarked after April 1, 2013. 6. Signed waivers: Due April 1. The Nationals 2013 waiver is required from each individual competitor, coach, and volunteer. You must have a NAIGC username and password to access the waiver. Each individual must sign the electronic waiver themselves. After you sign the waiver, this part of your registration will be marked as completed. The waiver is available here. 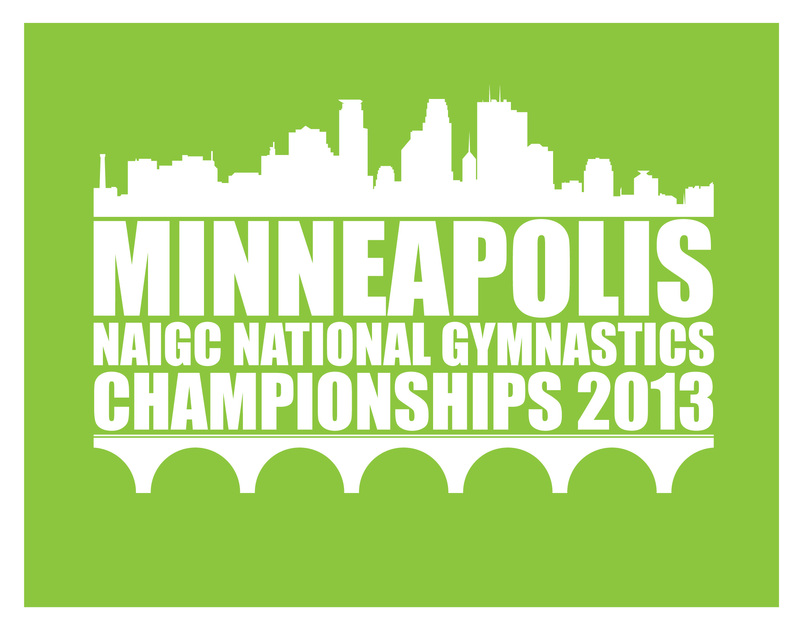 Nationals 2013 will have multiple preliminary sessions, and one finals session. Men will compete in some sessions, concurrently with the women. Teams from the NAIGC Alumni Club may advance to finals and receive team awards; however, NAIGC Alumni teams will not affect finals advancement for other teams, or the distribution of awards to other teams.